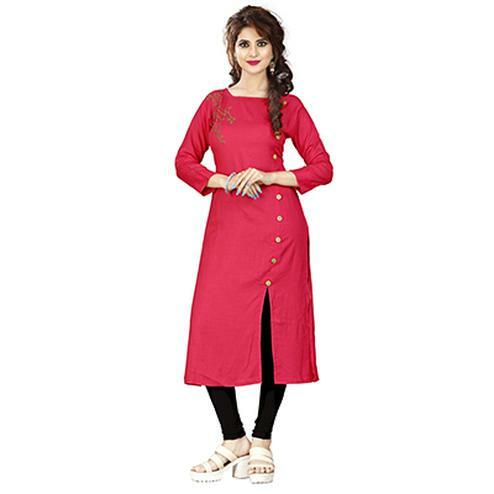 Peachmode has an extensive collection of pink kurtis for women. 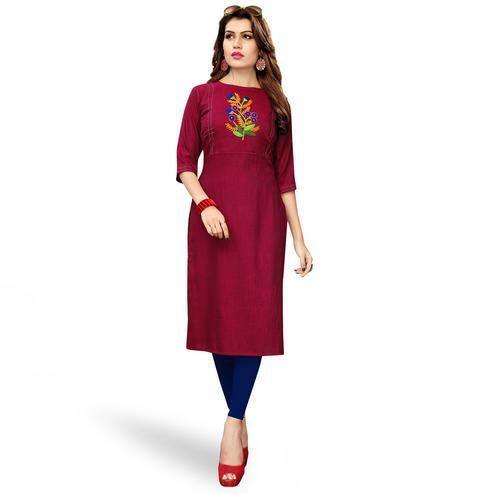 These kurtis are available in all styles- long kurtis, short kurtis, mid-length kurtis with attractive designs and patterns. 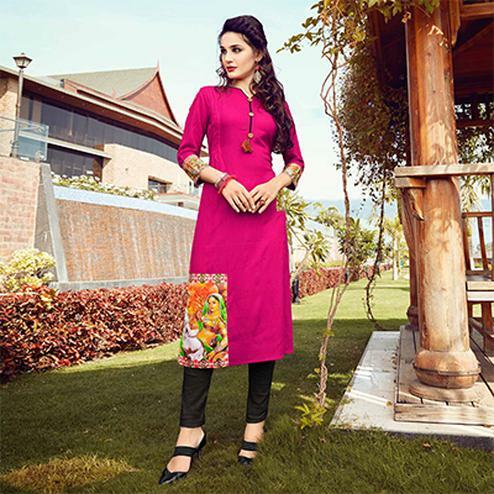 Our stylish kurtis are elegance personified and an absolute wear to your next parties. 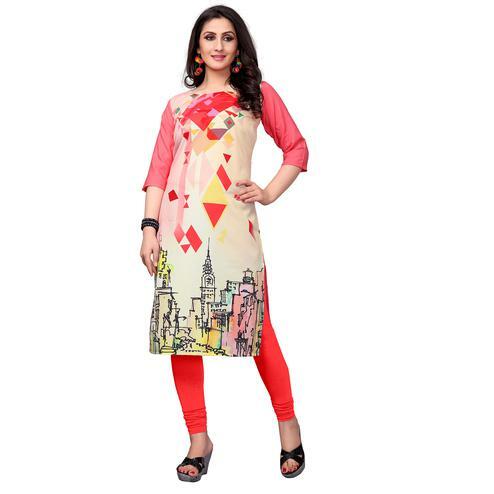 We also have a wide range of casual wear and work wear kurtis. 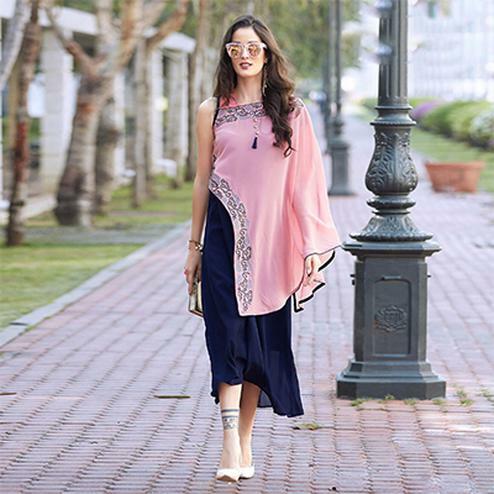 These designer kurtis are straight off the world of vogue that will have you transform into a diva instantly! 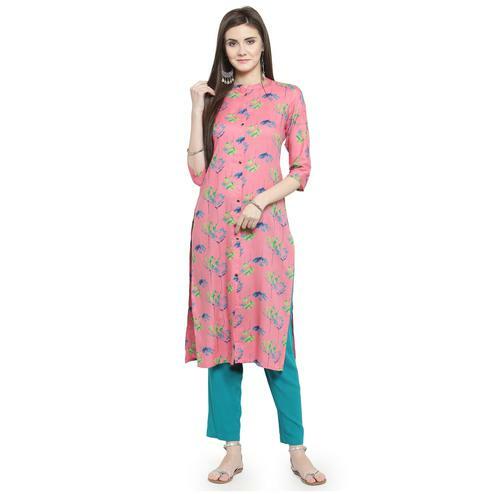 So whether kurtis for women or kurtis for girls, we have just what you’ve been looking for. The color pink represents love and strong emotions. There’s an unsaid attribute of charm, warmth, romance associated with this color. It also represents inner peace, harmony, well-being and tenderness. 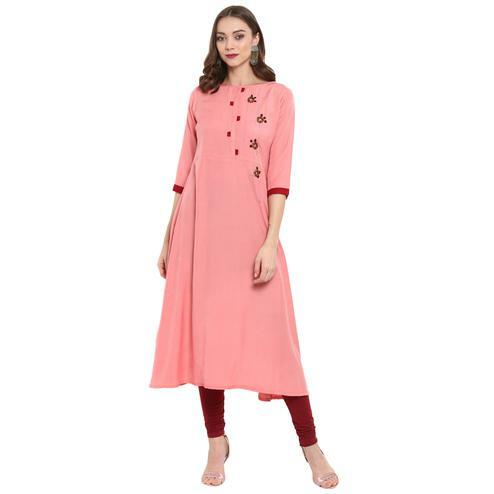 These attractive pink kurtis are available in a variety of fabrics- georgette, khadi cotton, faux georgette, crepe, rayon, muslin, cotton, pure cotton, Chanderi cotton, Jetpur cotton, flex cotton, art silk, satin, semi rayon and many others. All these fabrics are extremely comfortable to wear and are thoroughly tested for their quality and their durability. 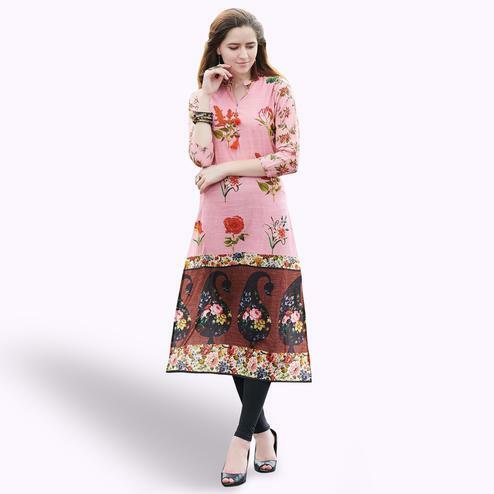 These kurtis come in stylish patterns and designs which include heavy embroidered work, thread embroidery, floral embroidery, hand embroidery, stone work, attractive prints, abstract prints, digital prints, tassels, button work, stylish cuts and patterns, chevron designs, geometrical prints, checkered prints, traditional work, diamond work, drape patterns, shibori prints- the list is exhaustive. 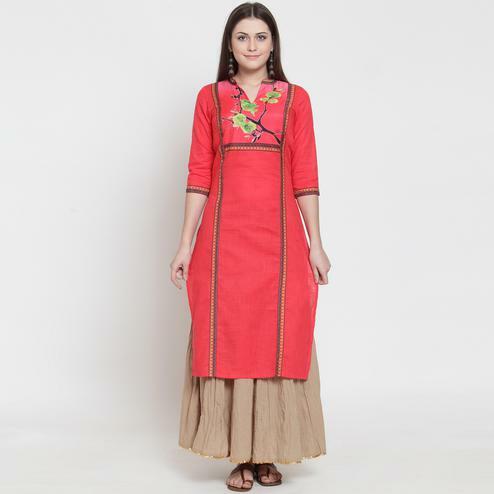 All our designs are put together to match up with the reigning trends so that you are in vogue always! 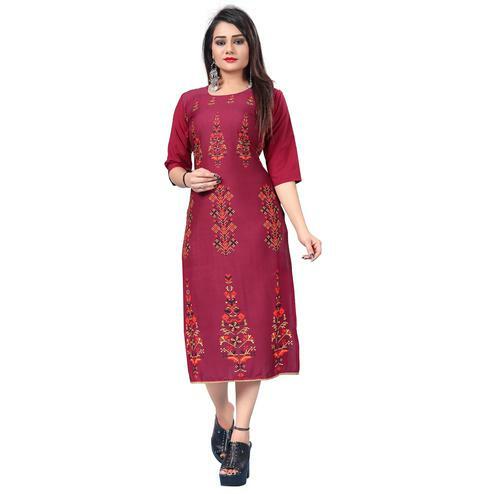 Our kurti designs also include exquisite embroidery work on the yoke, front slits, stylish drapes and flares, malai crepe linings, scoop necks, collared necks- to offer you something different always. 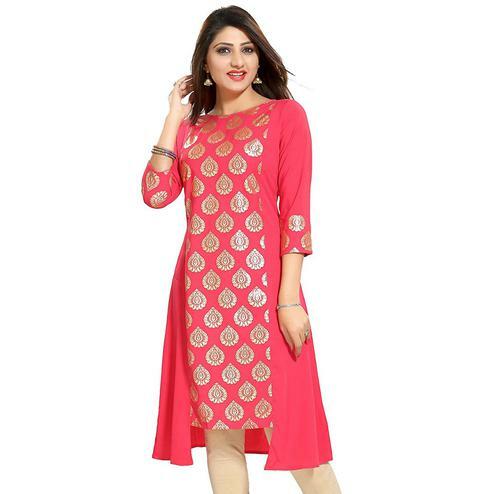 We also have kurtis in gown style that you can wear to wedding festivities or traditional functions. 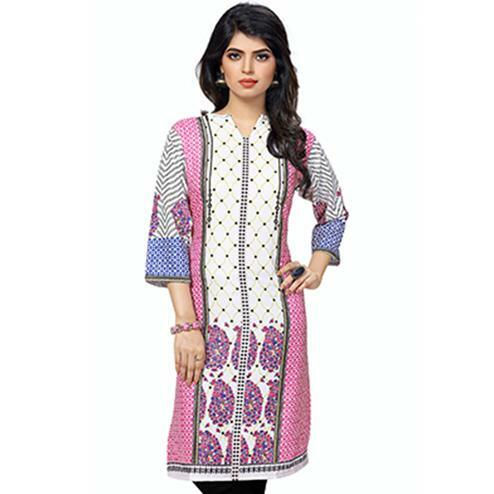 Our baby pink kurti designs with combinations of black and blue colors are simple with a pure hint of panache. 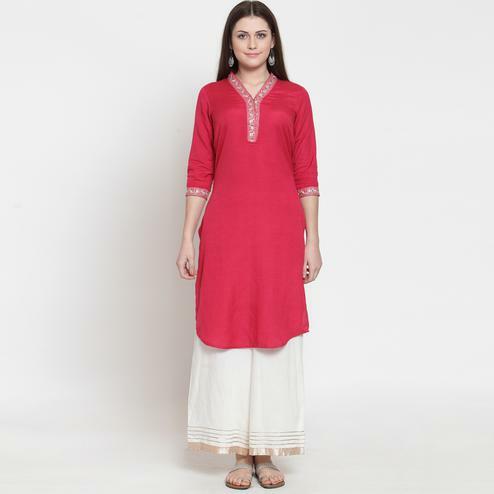 Wear these pink kurtis with jeans or team your pink kurtis with leggings- they blend perfectly well in each style. 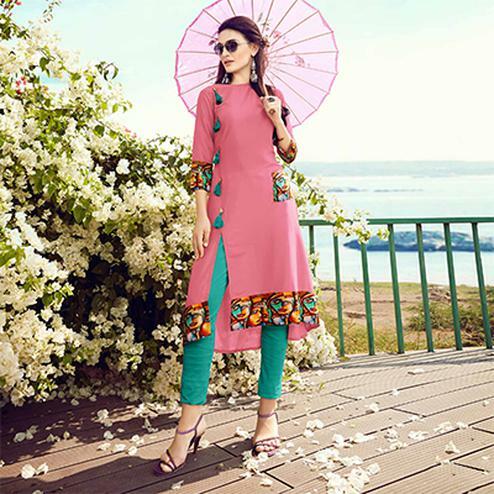 So don’t wait any further- head straight to Peachmode and buy these amazing pink kurtis online at extremely affordable costs and the best quality!